The U-shaped course maximized visibility (and photography) of the screen, course and participants. The first of five obstacles is one that replicated a steep, jagged terrain. LIDAR sensors were placed all through the course on the ground, so that when competitor’s feet tracked past certain points, the system would cue specific animated sequences. Beside the course, the team placed a vivid, 30-foot-wide, nine-foot-wide LED screen that played special sequences and displayed the leaderboard. 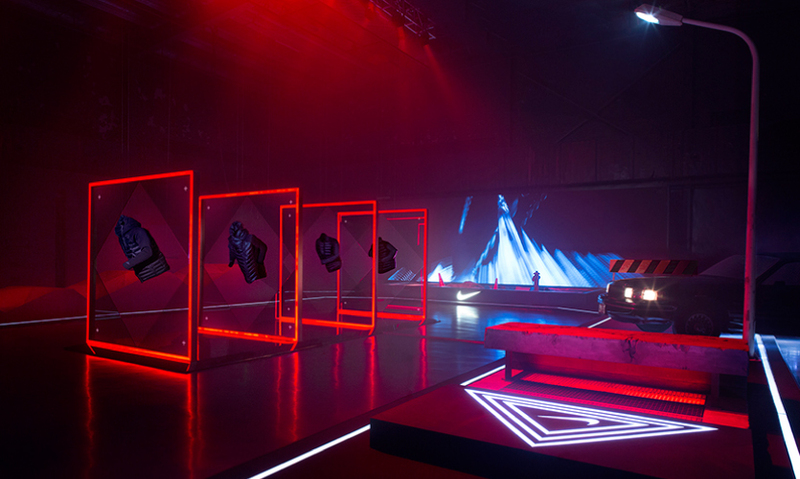 Leviathan custom designed product displays for the event, including red LED-lit ones for the Tech Pack Aeroloft Jackets. The course was built to be challenging yet accessible to competitors with a range of athletic ability. Nike’s “Test Stride” was an authentic experience that leap past typical product trials for 80 not-easily-impressed celebrities, bloggers, athletes and sneakerheads. A confluence of needs and situations created complicated balancing challenges for the design teams, from the theme of man versus nature, to form versus function and digital versus physical. Designing all of the interior spaces, including product displays and auxiliary event spaces was a new role for Leviathan. 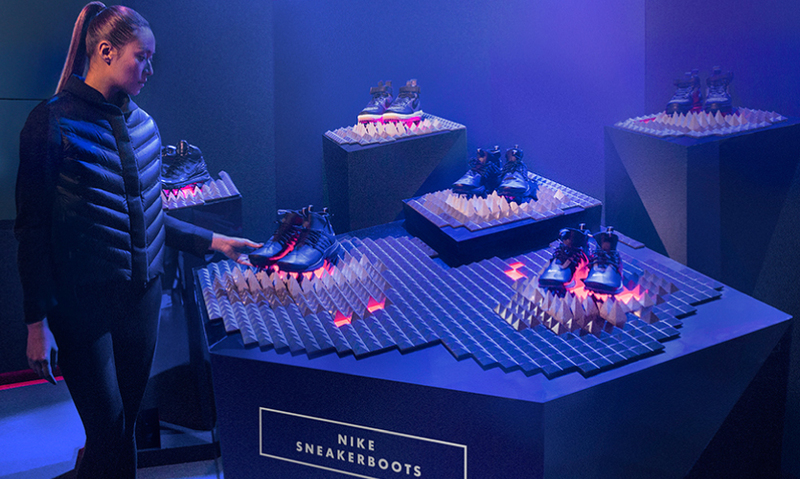 The theme of the SneakerBoot display aligned with the course and animations of combative winter conditions. This brand activation was particularly successful because of its hybrid approach and photogenic quality. Test Stride proved specific product features and benefits to trial participants, including the products’ ability to keep wearers warm, dry and safe from slipping in treacherous winter conditions. 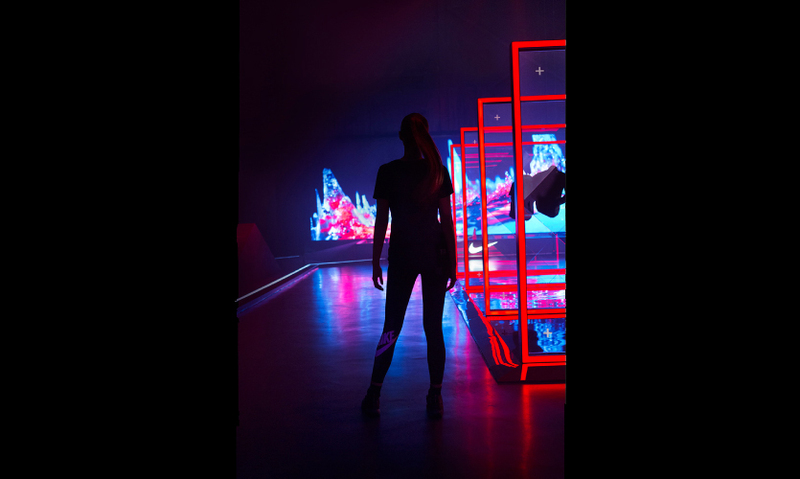 Nike was seeking a team to design and deliver an event bringing influencers and athletes together to test their latest batch of performance winter gear—and deliver Leviathan did—with an interactive motion-triggered urban test course. 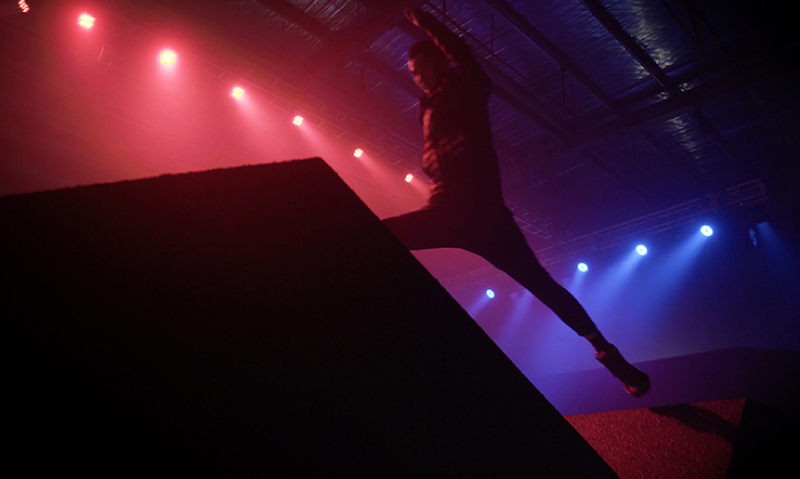 Dubbed “Test Stride,” it was replete with lights, visuals and complex obstacles. 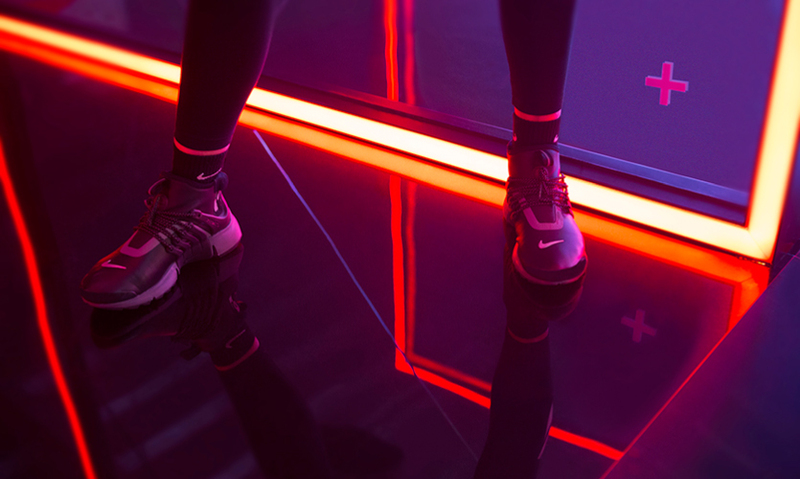 Nike executives came up with the initial idea of “Test Stride,” a new high-tech and imminently social-media-sharable approach to gear testing for consumers. They wanted to get media, influencers, celebrities and athletes talking about the new winter line of Tech Pack Aeroloft Jackets and SneakerBoots by presenting a rewarding way to try them together in a social environment. 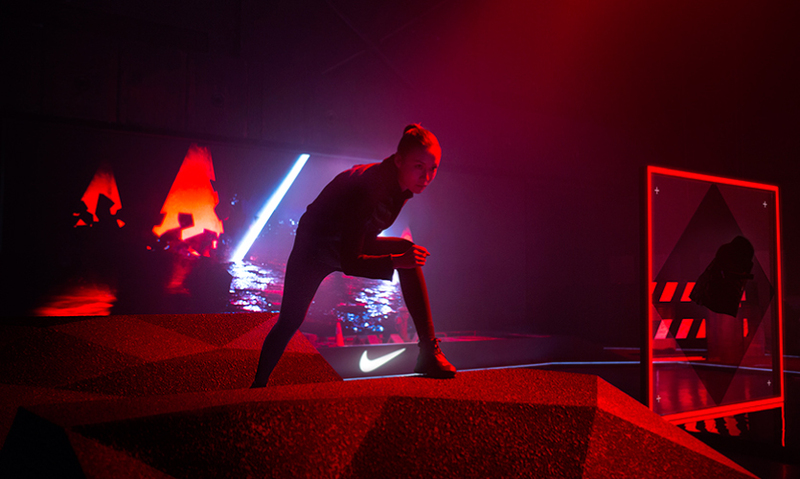 Leviathan’s expertise in creating engaging interactive digital experiences and integrating them into physical environments peaked the Nike team’s interest. Their goal: to create an attractive, advanced, exciting way to test and share their latest performance gear. 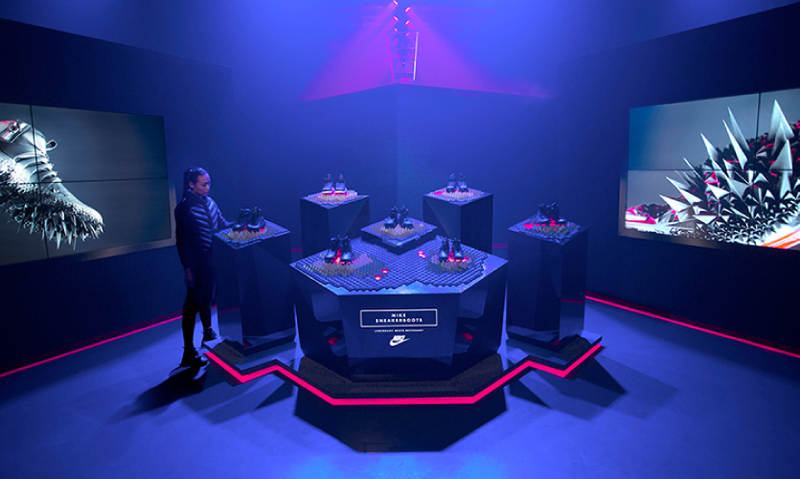 Specifically, the Nike team wanted to harness the most popular elements of Leviathan’s past work and combine them with real-world product trials. The aesthetic desired was ultra-contemporary and, of course, in line with the product look and feel. The Nike team wanted to prove some very specific product features and benefits to trial participants, including the products’ ability to keep wearers warm, dry and safe from slipping in treacherous winter conditions. Early phone conversations between the Leviathan team and one of the heads of one of the sportswear teams at Nike started to lean toward the concept of recreating real-life scenarios like city streets for the event. “It dawned on us that we needed physical elements like actual water and actual concrete,” recalls Jason White, Leviathan’s executive creative director. The obstacle course concept quickly became the obvious route, but having the solution be digitally interactive was something the design team had never seen or executed before. Leviathan pitched the idea, and Nike loved it. However, the design team also had to pitch the idea to Nike China’s sportswear team, as market conditions had shifted. “Test Stride” was originally intended to be a touring event with an opening in New York, but ended up being a one-time pop-up in Shanghai because the greatest need for a SneakerBoot event was in China. The pace of the project meant that the Nike and Leviathan teams weren’t able to complete extensive user testing of the course, instead opting for in-house testing with internal and production teams. Also, the concept of the course being built for and with digital media required an indoor application. Together, these two factors contributed to the team’s first balancing act: creating a course which was challenging to all, yet any participant could complete, regardless of their athletic ability (while looking chic in the gear, naturally). 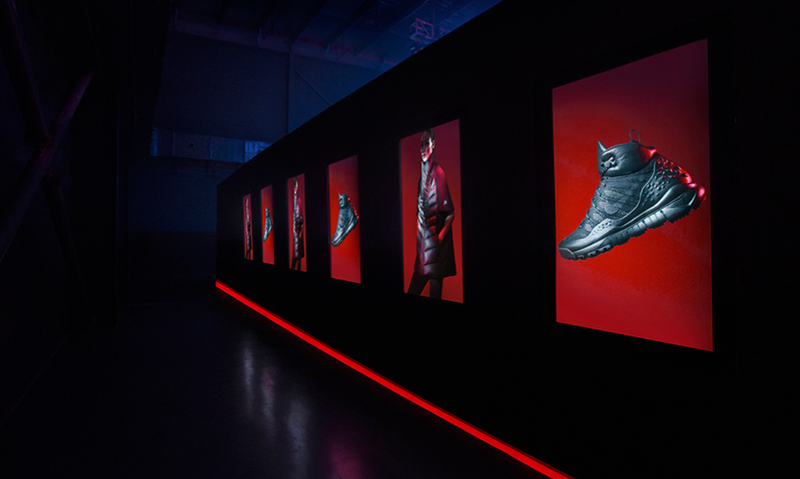 The next hurdle came in the form of a commission; Nike wanted the eight product displays to tie into the course conceptually. So, Leviathan was asked to complete that design work as well—a challenge they happily rose to. In fact, it was not only their first time designing displays, it was also the team’s first full-space design. 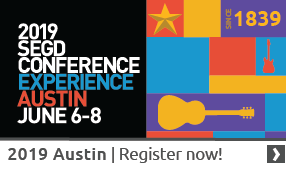 They collaboratively designed the event, from the entrance to the obstacles, displays and broadcast-quality video content loop that played between active competition times (shown in the video at bottom). Logistical issues put pressure on the design team as well. Pre-event, the team battled time-zones and on-site in Shanghai, there was a language barrier (the team ended up learning some Mandarin) and a last-minute fog issue: The fog machines used to create an atmospheric effect around the icy street obstacle was tripping the infrared sensors only an hour before the opening. 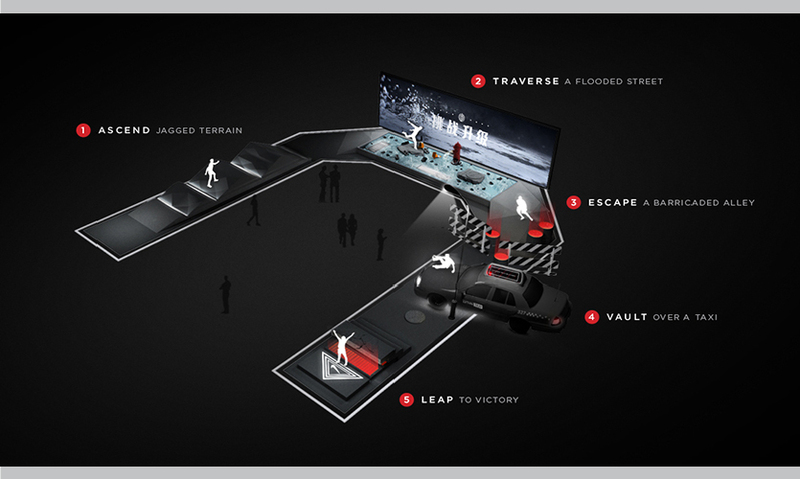 The “Test Stride” space begins with an entrance space where competitors can sign up via a tablet and opens up into a large room where the obstacle course sits in a 170-foot-long U-shape. The shape of the course is intentional and allows for the audience to easily photograph participants as they race against the clock, vying for leaderboard status. 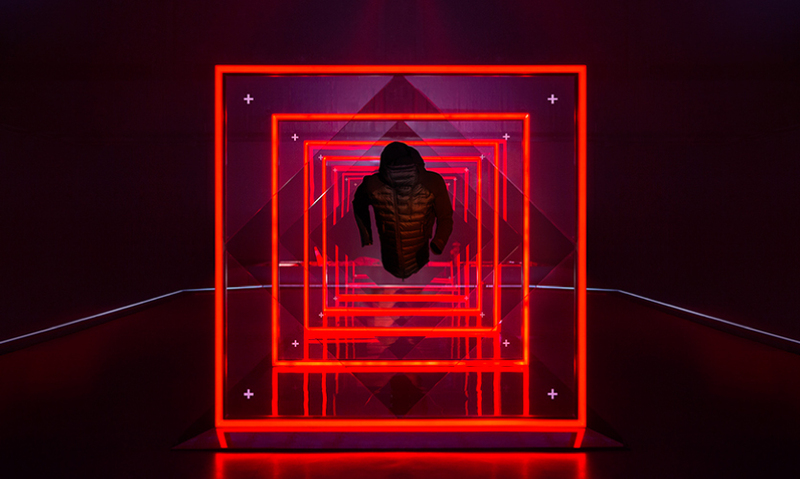 The shape also allows for maximum exposure for product displays, like the eye-catching red LED-lit jacket display placed at center-stage. Alongside the course, the team placed a vivid, 30-foot-wide, nine-foot-high LED screen. The massive screen served several purposes: to create motion and depth, to display encouraging messaging and stats to participants and to play triggered animation sequences. LIDAR sensors were placed all through the course on the ground, so that when competitor’s feet tracked past certain points the system would cue specific animated sequences on the large screen and simultaneously keep time and trigger a photo-capture to display their finish and position in the leaderboard. Arduino was used to bridge the physical-digital signal, TouchDesigner was used to cue pre-rendered video layers and integrate real-time effects and audio was cued using Ableton Live. Each of the five obstacles was categorized by a thematic zone, in concert with the features and benefits of the gear being tested. The five zones were ascend, traverse, escape, vault and leap. The corresponding obstacles were jagged terrain, flooded streetscape, barricaded alley, taxi and a concrete stair. Each was accompanied by a custom 3-D and motion animation built by the Leviathan team. Additional custom brand media content was created for event ambiance, taking the form of short, surreal, CG vignettes about Nike SneakerBoots’ counterattack on winter conditions. Throughout the clips winter elements like snow, pelting rain and spiky ice aggressively stage an assault on the SneakerBoots. The videos deftly match the spiked LED-lit product displays placed around the space to promote product engagement and photography. 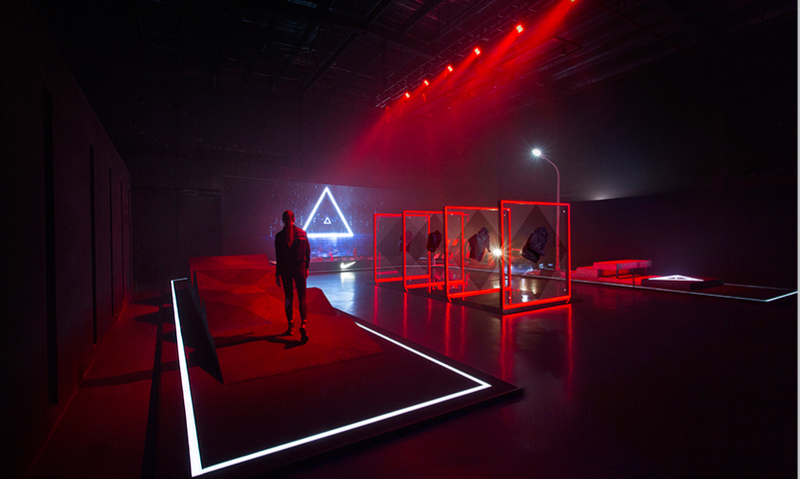 “I think the event was particularly successful and unique to Nike because of the combination of art exhibit, next-level of interactive technology and physical activity,” states White. 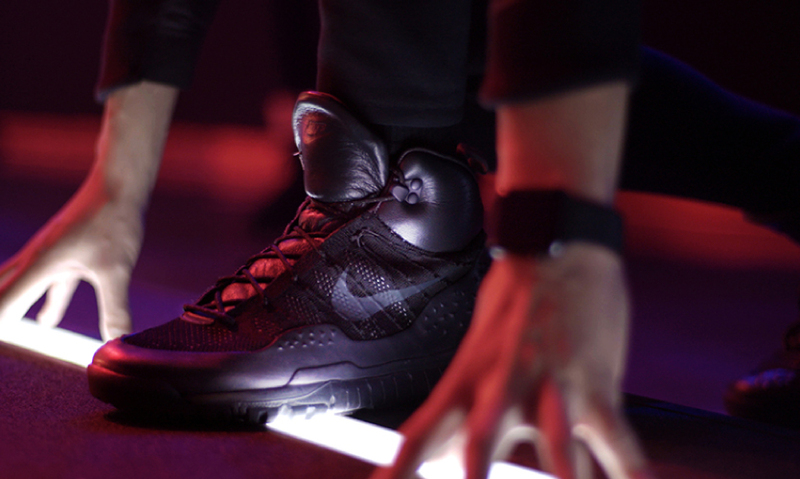 Nike’s “Test Stride” was an authentic experience that leap past typical product trials for 80 not-easily-impressed celebrities, bloggers, athletes and "sneakerheads" who ran the course and global media coverage of the event generated a lot of excitement around the product release. The physical action paired with interactive digital media effectively created a sensational brand spectacle. Participants at the event began by signing up, entering their data, suiting up with Tech Pack Aeroloft Jackets and SneakerBoots and preparing for their solo time trial. At the start line, they are greeted with “ready, set, go!” in Mandarin and they take off, ascending steep, jagged terrain. The next obstacle requires careful leaps across a cold, flooded, damaged street with manhole covers, bricks and frozen puddles. Each obstacle challenges different attributes of the product, such as traction on slippery surfaces or the ability to stay warm and dry in wintery conditions, so when participants jumped or tripped into icy puddles, it was an equally great product demo. In the next portion of the course, attendees traverse a dimly-lit, barricaded alley that led to a taxi hood meant to be slid over. In the final stretch, they long-jump over a broken sidewalk to land on the finishing platform. Their personal score is visualized on the big screen, along with a dynamic photo captured during the heat of the race. There were a few wipe-outs, but the result was an overwhelming success on all fronts and a lot of fun for all involved, giving participants a special, sharable opportunity to test out Nike’s stylish winter performance wear while accomplishing the client’s goals for the event. It was a victory for the Leviathan team in multiple ways as well, because it was a hybrid of their passions for design, digital media, interaction and art installation in the built environment. Project Area: 8,000 Sq. Ft.